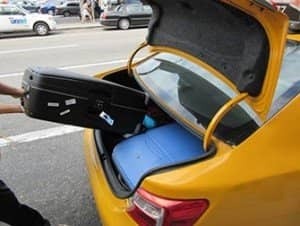 LaGuardia Airport to Manhattan transfer options are to either take a taxi, small shuttle bus or car service. LaGuardia Airport (LGA) is located in Queens, not far from Uptown Manhattan. From LaGuardia Airport, the taxi ride will cost between $30 to $50 plus toll and tip. There is no fixed price. From Manhattan to LaGuardia Airport, the fare depends on where in Manhattan you are traveling from. You can book a shuttle bus that brings you to your hotel or apartment. They cost $17 one way and are the best option if you don’t want to take a taxi. They take a bit longer than a taxi though, as they have to drop off other people as well. Book your seat on the shuttle bus before you go. You will get a voucher via email that you have to print out. You will find the shuttle buses outside the terminal. NYC Express Bus provides shuttle buses between Manhattan and LaGuardia Airport. The buses run approximately every hour between 11:00 and 19:00. Kids under 5 years old are free. To travel from LaGuardia to Manhattan, you first need to take the bus to a subway station. If you are headed to Midtown or Downtown, take bus Q70 to Roosevelt Avenue. Here, you can transfer on to subway lines E, M, F, R and 7. If you are going to the Upper East Side or Upper West Side, take bus M60 to 125th Street. Public transport is especially cheap. Keep in mind that you will need to change multiple times, not so handy after a long flight and with lots of luggage. Eric’s Tip: I would recommend taking a taxi to and from LGA Airport, it’s just the easiest way. The small or the large buses are also a good option but take longer. Don’t try to take public transportation, it’s just not worth all the hassle.